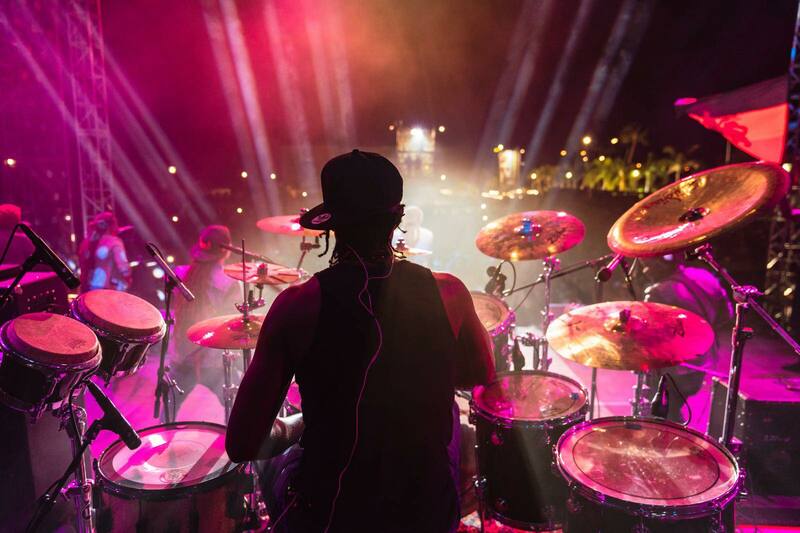 Courtney Diedrick, also known as “Bamdrumz”, is the official drummer for Damian Marley. We meet him in O2 Academy Leeds (Uk) during Stony Hill European Tour 2018. Straight from Jamaica, and exactly from Brown’s Town (Saint Ann), “Bam” informs us about the legendary drummers who inspired him during his journey: Carlton Barrett from Bob Marley & The Wailers, Sly from Sly and Robbie, Squidly Cole from Stephen Marley, Deleon White also known as Jubba from Dubtonic Kru and many more. He feels good to inspire the new generations today, especially in his community, because he believes this is the meaning of playing music. Secondly, he underlines the attachment with his family and to the brothers John, Rayon and Sean. All his siblings are musicians and they helped in molding his career prior to furthering his studies at Edna Manley College of Music in Kingston. His older brother John met Damian in Montego Bay and later introduced Sean aka “Young Pow” for the audition as keyboardplayer, who surprisingly saw that drummers were also being auditioned, so he passed on the news to “Bam”. His history began much earlier when he started playing in church at age of 16, later on in Hotels, teaching music in high school and now touring the world with “Jr Gong”. He still remembers his level of anxiety when he went to audition to play and he could see a long line of drummers from around the world waiting for their turn. Despite the insecurities of the moment, Courtney “did his thing” and reached the goal. He discussed the importance of never forgetting that positive vibration that musicians should feel when playing their instruments. He tries to treat every opportunity he gets to play with passion as if it was his first time playing the drums: “Playing with Damian is a great feeling that will never leave me because the moment you lose that feeling, you lose everything”. Then we talk about the most beautiful memories of his tours in the world: “We have a lot of highlights and many other stuffs that have happened on the road, but to visit the Mother Land Africa was a huge deal for me, it was always my dream even before I started touring.”. “Bam” tells us how much his origins have influenced even his style of playing. Reggae is a music full of feelings that reminds us of the past, for example slavery: “You can feel emotions in reggae – he continued – and my playing has a lot to do with my roots and my culture”. Courtney is the Grammy Drummer of this year with “Stony Hill” Album. Nicely, he gives thanks to all the fans for it sharing with them his happiness about this result:“I rememeber all the nights that we spent in the studio with my crew without getting any sleep and now this great joy finally pays off”. He didn’t work only with Damian Marley but with several international artists as Mick Jagger, Nas, Kieth Richards, Eric Clapton, Dave Stewart, Joss Stone, Playing for Change P.F.C., I-Taweh, Jah Cure and many more. Playing for Change is a project between street musicians and mainstream ones from all over the World. This group is the perfect example to show people we are more alike than different and it doesn’t matter our culture or the color of our skin. Reggae music is a universal language. One of Courtney’s future projects is to give more light to the jamaican drummers featuring them on a documentary. Another project is about his productions that are in a pause right now, but will be out soon. Passion, talent, determination, attitude, gratitude and humbleness are just some of the features that makes Diedrick so popular and respected in the actual worldwide musical scene. We are waiting to hear his riddims and to appreciate him in the role of producer as well.